At the appointment that your appliances are placed, our clinical staff will give you thorough instructions, tips, and dental aids to help you keep your teeth as clean as possible during treatment. At that point you will learn that brushing and flossing with braces can be a bit more challenging than your usual routine. It will take you a little longer than usual because you will have to brush and floss more carefully and more thoroughly; this is because food tends to collect around and between braces, helping to create excess plaque. If plaque remains on the teeth for any length of time, it will leave a permanent white scar on the surface. In order to avoid the buildup of plaque and staining of your teeth, brushing after meals should become part of your daily schedule (keep an extra toothbrush and floss at school or at work to use after eating). Use a soft toothbrush with firm pressure, and brush at a 45-degree angle to the tooth; brush in small circles above and below the brackets. Your toothbrush will wear out faster because of your appliances, so be sure to replace it whenever the bristles start to fray. Some patients find it easier to keep their braces clean by using an electric toothbrush. Flossing is also very important and should be done every day. 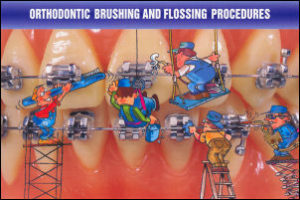 Floss threaders are reusable, and make flossing with braces much easier. Patients who have greater difficulty flossing with braces, find a water floss system like Waterpik to be very helpful! We also recommend that you see your general dentist at least every three (3) to six (6) months for a deeper, more professional cleaning and exam while you have your braces on. We feel it is important to work closely with your general dentist to help ensure that your orthodontic treatment results in the healthiest bite and most beautiful smile possible! 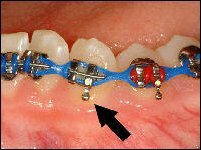 It is best to leave the bracket in place if there is no discomfort. If there is discomfort, first place wax over the sharp area. If the bracket has an alastic ligature, you can use a toothpick to remove the ligature holding the wire in place, then remove the bracket. If the bracket has a wire ligature, you can use a nail clipper to cut the ligature wire and remove the bracket. Call our office and we will schedule an appointment to replace the bracket. If any of these ligatures come off, call to schedule an appointment to have it replaced. If you notice that the tooth is moving away from the arch wire, the ligature should be replaced as soon as possible. Stop rubber band wear if the rubber bands are connected to the bracket with the missing ligature. If you experience minor discomfort after a visit, you may take the pain reliever you normally take for a headache. This discomfort varies greatly from patient to patient, but can peak the next day or two subsiding to even a week later. Due to advances in the dental materials, even if you are not experiencing any soreness, your appliance is still working – your teeth are just used to the pressure. In case a rubber spacer falls out, take two pieces of dental floss and insert them through the spacer. Pull on both pieces of floss to stretch the spacer, and then slide the spacer back and forth between the two teeth where it belongs. Once the bottom half of the spacer slips under the tight spot between the teeth, release and remove the floss and the spacer will fit back properly. Stop wearing the appliance and call our office immediately. We will determine how soon to schedule an appointment. Be sure to bring the appliance to your appointment. Sometimes wire ligatures unravel, or the larger arch wires break or slide out of the back bands. Use a Q-Tip or pencil eraser to push the wire so that it is flat against the tooth. If the wire cannot be moved into a comfortable position, cover it with dental wax (see below). As a last resort, the wire can be clipped just behind the last attached bracket with a toenail clipper or small wire cutter. Dental wax is used as a buffer between the braces and your mouth. It can be used whenever there is something that feels irritating to the lips, cheeks or tongue. Simply pinch off a small piece of wax and roll it into a ball the size of a small pea. Then, dry the area as best you can and apply the ball of wax onto the rough area. Don’t be surprised if you need to reapply the wax several times a day, since normal talking and chewing activities will tend to dislodge the wax from some areas of the mouth. Don’t worry if the wax is accidentally swallowed – it’s harmless. It is best to leave the band in place if there is no discomfort. Call and we will schedule an appointment as soon as possible. If the band has come completely off the tooth, remember to bring it with you to the next appointment. If the band is on a tooth where a headgear is attached, stop wearing the headgear until the band can be recemented in our office. Be sure to bring the headgear to the appointment. If the lower jaw locks open or closed, it may signify temporomandibular joint dysfunction. Call immediately to schedule an appointment. Many times, a hard blow, such as being hit in the mouth with a ball or falling off a bike, can embed the braces into the cheeks, loosen or knock out teeth, or in rare cases, break the jaws. It is important to be seen as soon as possible to alleviate any discomfort and rule out any broken teeth or bones.